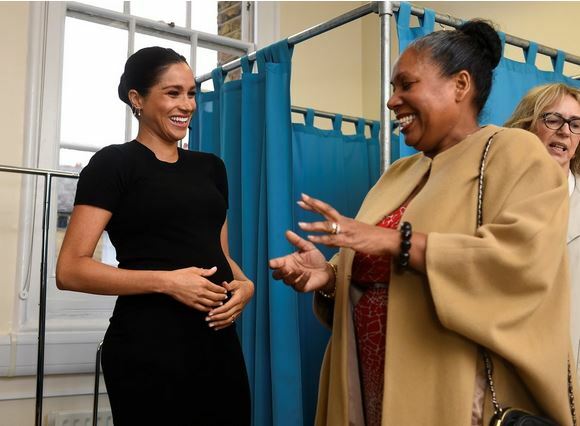 The Duchess of Sussex, Meghan Markle, made her first patronage to work with the charity organization, Smart Works, that works with women who are seeking to improve their job pursuits (via interview skills & wardrobe choices). The mother-to-be arrived in a black materntiy t-shirt dress by Hatch & Oscar de la Renta coat with a Victoria Beckham purse & cow print heels. The looks was in keeping with her minimalist elegance, especially as she radiated with positivity & style. Of course, Meghan’s wardrobe budget can’t compare to most of ours, but her designer pieces are available to shop online. See below. 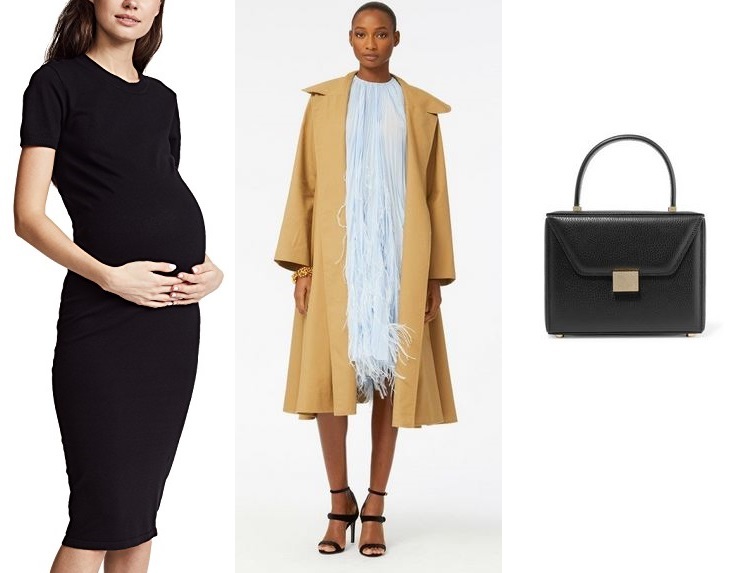 SHOP: Hatch maternity t-shirt dress @Shop Bop, coat @Oscar de la Renta, & Victoria Beckham purse @Net-A-Porter. However, to achieve a look similar to Meghan’s (pregnant or not), I scoured the web for similar & affordable items that are also chic wardrobe essentials. The LBD could be styled for day or night depending on your accessories. Also, a neutral coat is a must-have for the colder months. SHOP: Isabel maternity t-shirt dress by Ingrid & Isabel @Target, t-shirt dress @Old Navy, pea coat @Milanoo, Emmala pointy toe pumps @Nine West, & Kelly & Katie purse @DSW. What do you think of Meghan’s demure look? How would you style a little black dress? For more celebrity-inspired posts, check out Michelle Obama’s holographic boots, pearl-inspired looks from Brie Larson & Rihanna, Jessica Alba’s gold top, & Jennifer Lopez’s Second Act premiere gown. Happy Styling! When in doubt, I always turn to accessories & jewelry for gift giving. It’s fun for me to shop through stacks & stacks of sparkly goodies, where I can always find a little something for myself too. However, with the days counting down closer & closer to Christmas, I’ve been curious about affordable stocking stuffers for our stylish friends. Jewelry is a perfect way to go, especially if you know someone’s style really well. When you find that special something, it’s hard to resist the spirit of gift giving! What’s especially great about my five latest picks is that the most expensive is $18, which works fro a budget-minded shopper. Where are you shopping for stocking stuffers? Are you ready for the holidays? What sort of jewelry do you like to wear this time of year? For more posts on accessories, click here, here, here, & here. Happy Styling! It’s no secret that when I find a style of something I looooove (like can’t-live-without-it love), I have to have it in every color / style. That goes for earrings, sweaters, skirts, & shoes–especially shoes! 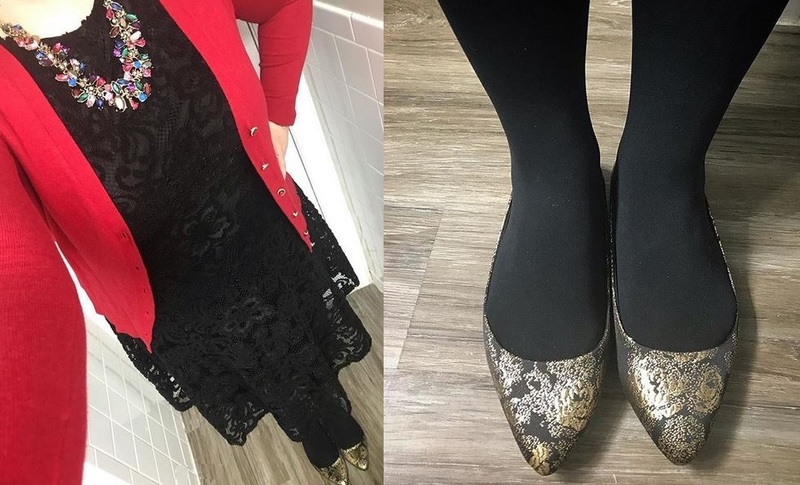 I’ve written about the Gigi flats by Christian Siriano for Payless previously (here), but now that I’m wearing these black & gold brocade shoes (for the first time, for a work holiday party), I’m shocked that they’re already on clearance for $12.00! That’s an amazing must-have price for shoes that can really be worn for any special occasion. I will forever & always love me a high heel stiletto, but ballet flats have been tiptoeing into my heart for quite some time now & I feel no shame in wearing them. I’m not settling. I’m simply considering comfort along with style & with flats like these, I don’t have to sacrifice style one bit. The only downsides (that I’ve noticed) is that not all Gigi styles are available in wide width, & also that the soft exterior probably won’t withstand wet weather. However, trying out a little pop of sparkle in the gold brocade will definitely add a splash of timeless sass for girls’ night out, an evening work function, or for just having a little fashionable fun. What do you think of these brocade flats? How would you style them? 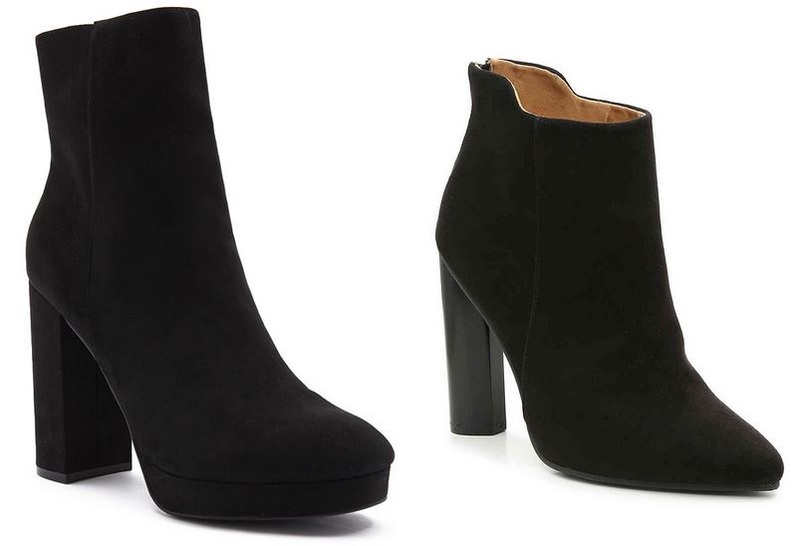 For more shoe-inspired posts, click here, here, here, & here! Happy Styling! Last-Minute Holiday Gift Ideas from H&M! It’s crunch time for holiday shopping & I know I’m scrambling for last-minute gift ideas for loved ones. However, in my search, I’m coming across a bunch of great finds for readers to consider from none other than H&M, which means these picks are not only affordable, but have a little extra personality & style, whether it’s a trend piece or something cozy. Any time you’re exchanging gifts, it’s always a good idea to consider a budget, but also, create a list with descriptive words & their interests. Here are some of my favorite picks from H&M to help make this season a little brighter & definitely more stylish! What’s your favorite of these last-minute holiday gift picks? Where do you shop when you’re in need of a quick gift? How do you prepare for the craziness of the holiday season? For more holiday inspired posts, click here, here, here, & here. Happy Styling! Affordable Pearly Whites for the Holidays! Sometimes when I can’t make up my mind of how I want to style my outfit in terms of jewelry, pearls are an easy go-to for instantly adding some much-needed glam & sophistication to an otherwise casual look. The holidays are the perfect time of year to consider pearls, & not just for jewelry must-haves.Take inspiration from the stylish likes of Angelina Jolie, Brie Larson, Lupita Nyong’o, Reese Witherspoon, Rihanna, & Zooey Deschanel, all donning pearls in earring, bracelet, or necklace form. One of my favorite shopping spots, New York & Company, has some stylish & affordable pearly finds to wear for your next holiday party, date night, girls’ night out, or even sipping on some hot cocoa while wrapping presents. However you choose to wear your pearls, own them. Pearls are timeless & go with any outfit.I love glamming up a casual Sunday with a pair of cluster studs, for example. The pearl resurgence that we saw last holiday season on clothing isn’t going away either. How do you like to wear pearls? Do you have a favorite pearl accessory that you love to wear? For more jewelry inspired posts, click here, here, here, & here. Happy Styling! 12/17/2018 Darling of the Day: Jessica Alba’s Goes Gold! Whenever I’m seeking out style inspiration from celebrities (on the red carpet or their street style), my mind immediately races with ideas on how readers (& myself) can make a look their (affordable) own. Style isn’t this inaccessible thing anymore since there are so many reasonably price retailers that look to high fashion sources for their own inspiration too. Hence my latest post featuring actress / entrepreneur Jessica Alba dressing down a gold sparkly blouse with a velvet blazer by Frame (shop here), frayed wide leg jeans, black suede booties, & a gold buckle wide belt. A blazer & jeans are two staple items that we all have in our wardrobe, which is why this look is so easy to recreate without breaking the bank. To build this look, here are two essential pieces, which can also be mixed & matched with other items throughout the holiday season & during the year. Which celebs do you turn to for street style & holiday inspiration? How do you get the most use out of your favorite & most sparkly holiday pieces? For more celebrity style posts, click here, here, here, & here. Happy Styling! Red Hot Holiday Dresses for all Sizes! The holidays are around the corner & I can’t help, but embrace all the luxurious reds in my wardrobe, whether it’s velvet, brocade, knits, suede, or leather. However, a little red dress for this time of year is perfect for celebrating all that’s joyful & stylish. Red isn’t just stylish in a fire engine hue; there’s crimson, burgundy, apple, & so many more shades to mix & match with metallic accessories. I’m pretty obsessed with red this last week (as seen by my latest Instagram posts), which is why I’m inspired to share these flirty & seasonal red dresses. These dresses might look extra fancy, but they can be styled many different ways to get the most wear out of them. For example, try knotting a denim button down shirt over one or throwing on a chunky sweater & use the skirt as a dress? Red is also a great foundation for a gold statement necklace, silver accessories, or black beads too. For more holiday posts, click here, here, here, & here. Happy Styling! My Favorite Sequin Sweater This Season! As I was gearing up to go back to work this fall, I’d been collecting gift cards from the summer & my birthday to prepare me for some new fall favorites & holiday must-haves. This includes the sequin sweater @dressbarn (shop plus size here). 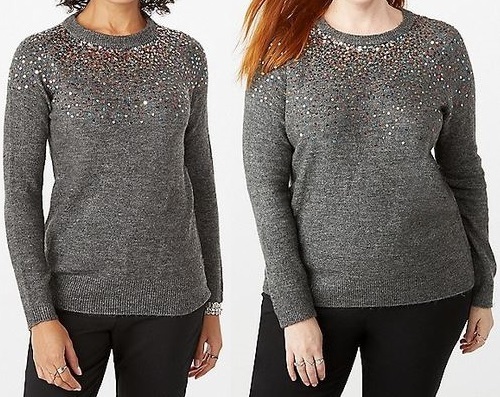 I ordered this sweater online & was actually surprised how soft it felt, how comfortably it fit, & just how pretty the sequin detail is on the cozy gray background. While I’m all about the big statement necklace lately, I know I can rely on this sweater to do all the sparkling for me if I need something festive quickly. I have a multicolor pair of Kate Spade confetti stud earrings I’m waiting to pair with this sweater for either a glitzy weekend look with leggings & knee boots, or even to my office holiday party with a pencil skirt & embellished ballet flats. Because of the neutral gray background & variety of color in the sequins, the styling possibilities are endless! How do you like to wear sparkle? Where are you shopping for your most festive fashions? For more holiday-inspired posts, click here, here, here, & here. Happy Styling! Leopard Tops for All Sizes! If there’s one print I love for any time of the year, it’s leopard. It’s a fun option for a sweater, blouse or top to pair with jeans, leggings, pants, or a skirt, especially when matching it up with a pop of color like red, hot pink, or green. Wearing a leopard top also opens up the opportunity to try some playful bling too in a statement necklace, big earrings, or stacked bangles. Here are some affordable must-have leopard options for misses & women’s sizes for sale now! When it comes to leopard, you don’t always have to wear black with it. Try something with texture, a seasonal color, or add a little sparkle. You can definitely get a lot of miles out of a leopard top because of all of its styling possibilities. How do you like to style leopard separates? What are your favorite patterns to wear? Where are you shopping most for affordable fashion this season? For more posts like this, click here, here, here, & here. Happy Styling!